Today, there are countless different strains of Cannabis, all of which have spawned from the two original types of this plant: Sativa and Indica. Sativa is typically the taller, more sparce plant with longer branches, fewer leaves along the branches and usually light in pallour. Indica is a shorter bushier strain of plant. This plant is a lot more stout and females bud much more. Because of cross breeding, cloning, grafting, and other things, a strain of pure sativa or indica today is near impossible to find. Cross breeding can either occur natrually, or can be done purposefully by man. When this happens naturally it occurs most often by a sativa plant pollenating an indica plant, or vice versa. Cloning and grafting are both done by man and this is usually done to attempt to grow a plant with the benefits of both sativa and the indica strains. From here, plant strains get somewhat more complicated with cross breeding, experemental growth and budding lamps, variable conditions of growth, and synthetic growth stimulants (Bud-Gro, Ph balance etc) thousands of different strains emerged, all cheifly searching for a mix of perhaps a smoother, more pleasant taste, along with a high THC content, and generally ideal effects when smoked. All of the above strains are obviously a cross between sativa and indica, but it is posible to articulate which strain is dominant in each. The cannabis plant has two genders, male and female. However, there can also be hermaphrodite plants, which are both male and female, although when growers come across these they are usually removed for the fact that they do more harm than good. Male plants do not bud, they create pollen, which when administered to a female bud, will create seeds. Because of this, when growing, there is a simple rule about plant genders, if you want seeds for next season, leave the males, if you want bud, then remove the males as soon as they can be identified. If cannabis is being grown for the purpose of smoking, males are primarily useless because the only part that is smokeable is the leaf, which is hardly used today. 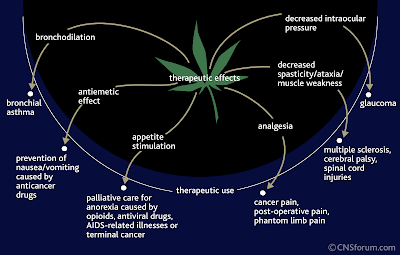 THC, or Tetrahydrocannabinol is the main reason that Marijuana is smoked. This is the active chemical that gets the user 'high.' THC does this by reacting on certain receptors on the users brain. Effectively it is pushing buttons on the brain which bring the user feelings of pleasure. THC is produced cardinally in the bud of the plant, althought it is also present in smaller amounts in the leaf. It is activated by heat at around 120 degrees farenheit and is destroyed at around 240 degrees, with its boiling point at 200 degrees. The THC in the cannabis plant is produced as a defense mecahnism to protect itself,and its spawn. This is the reason that THC is produced only when the plant reaches maturity. Ideally, Cannabis is grown in an area of altitude where it gets around 8-12 hours of regular, hot sunshine per day. The plant is essentially a very hardy plant under its original conditions, but when it is grown out of it's native area problems arise. Cannabis has grown since ancient times in places such as China, India, European countries and more. It is a diverse plant which will grow under many conditions it is not used to. Today cannabis can be grown just about anywhere. If the conditions outside are too harsh, then cannabis can be grown hydroponically, with growth lamps, bud lamps, reflectors, exhast fans and other equipment which essentially synthetically emulates prime growing conditions for the plant. Reproduction will happen naturally if there are many plants growing together, as the male will fertalise the female, and instead of her producing buds she will produce seeds, and this is why when plants are grown for budding males are removed early in the process. Many growers do not not like doing this to get new plants because it means a whole crop has been used just for seeds, but sometimes it is neccesary. There is another way to reproduce plants, and it is called cloning. To clone a plant the basic procedure is to wait until the plant is of a decent size, then the crowns of the stem are cut off, treated in a chemical, and then put in rockwool under a growth lamp so that they can take root. Once they have taken root they can be put under the normal hydroponic lamps.